There is a technique in genetics called shotgun sequencing by which you can sequence a large amount of DNA (say an entire genome) by breaking it into smaller random pieces, analyze each piece, and then construct a full sequence by finding where each segment overlaps and lining them up. After reading Daredevil #22, I decided to try my hand at shotgun reviewing. You see, there’s so much going on in this issue – and I do mean that in a good way – that I don’t even really know where to begin. Add to this the fact that there are so many details, particularly in terms of the visual storytelling, that I realized I wanted to comment on, but which don’t follow a particular pattern. At the end of the day, the only way I’m going to squeeze a review out of this issue is by looking at different aspects of it that caught my attention, with little regard for structure. I hope you’ll forgive my unorthodoxy. To really underline the randomness of this review, I’m going to start at the very end. Don’t worry, I won’t actually give it away – in fact, I’ll try to keep this review as free of outright spoilers as I can – but suffice it to say that we are treated to a revelation that will have a huge impact on the civilian aspect of Matt Murdock’s life, and those of his friends, for the foreseeable future. It is a definite first in Daredevil history and touches on a surprisingly mature subject matter. While I’ve never argued that Waid’s Daredevil is all retro fun and games (in fact, I’ve argued the exact opposite), this amounts to some pretty heavy stuff. I can also see some fans reacting to this development with a certain amount of “WTF? !”, but I would say that it actually explains a great deal about the dynamics of Matt’s relationships over the last few months. Moving on to our next random segment: Chris Samnee deserves some kind of award for most painfully visceral sound effect (see below). If you thought just thinking about a dislocated shoulder was bad enough, imagine that being illustrated by spelling out the sound in freaking bone font! That shoulder really does look pretty badly mangled, too. Well done, Mr Samnee, well done. *slow clap* This isn’t the only instance of really inventive use of sound effects in this issue either. Two panels down, you’ll find an example of Daredevil listening past Stilt-Man’s exterior to decipher the sounds coming from within, and these sounds are shown on the page in a really clever and inventive way. I also want to heap some general praise on the arts team for the way the fight scene is handled on the page. 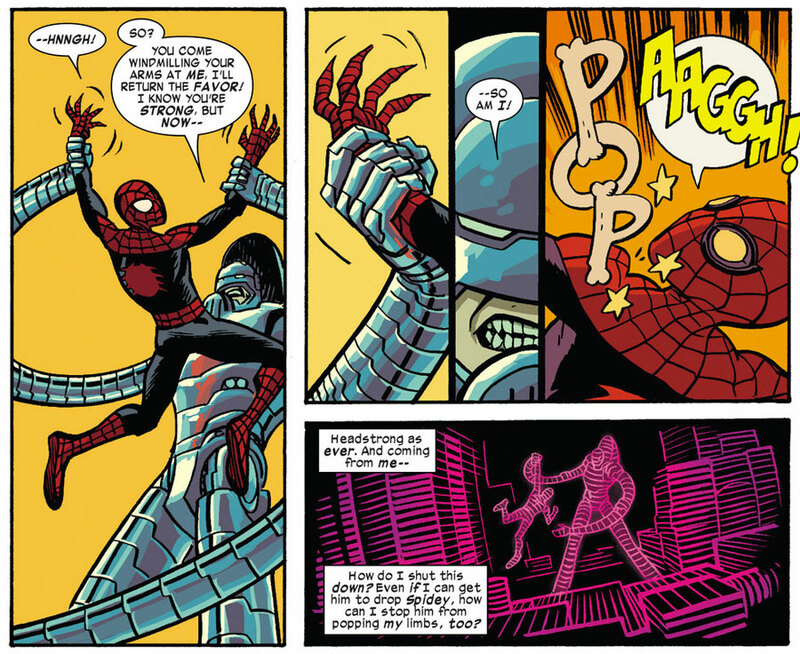 For once, the script offers a hero vs. hero fight that doesn’t seem forced (because Spidey, as we all know, isn’t exactly himself anymore) and Chris Samnee seems to have a lot of fun with it. When Stilt-Man is brought into the picture (no that’s not a spoiler, he’s on the cover…), the action pops even more. Stilt-Man actually comes across as menacing, and I really dig the way Javier Rodríguez’s colors provide a great contrast between the shiny, steely exterior of Stilt-Man’s armor and the more muted earthier tones of the background and the other characters. The panels remain clear, vibrant and engaging throughout. Speaking of the action scenes that make up the center of this issue, I have to give two big thumbs up to the way Mark Waid has scripted this first encounter between Daredevil and Superior Spider-Man. The dynamic between the two characters has changed dramatically as a result of the Doc Ock mind switch, and suddenly Daredevil comes across as the talkative one with the humorous perspective. At the same time, Waid manages to not let Superior Spider-Man act so strange that Matt can’t, at the end of their interaction, brush off Spider-Man’s antics as a fellow “costume” just having a really weird day. For the sake of the plans presumably in place for Superior Spider-Man, every writer handling the character has to walk a thin line between having him act differently, but not raise so much suspicion that his secret is revealed right away. Waid handles this dilemma exceptionally well, and the characters’ interaction is a real treat for the reader. While the action goodness in the middle half of the issue represents one extreme of superhero storytelling – men in costumes fighting a particularly outrageous super-villain – the beginning and end serve to bring us back to Earth by confronting both readers and characters with very real issues and situations. I’ve already touched on the dramatic ending and won’t divulge more except to say that the crucial twist serves to remind us of how the citizens of the Marvel Universe suffer from real-world problems on top of living with the constant threat of Galactus invading the planet. As far as the first few pages go, we see Matt dealing with problems of a completely different nature than those he faces in his battle against first Spider-Man and then Stilt-Man. 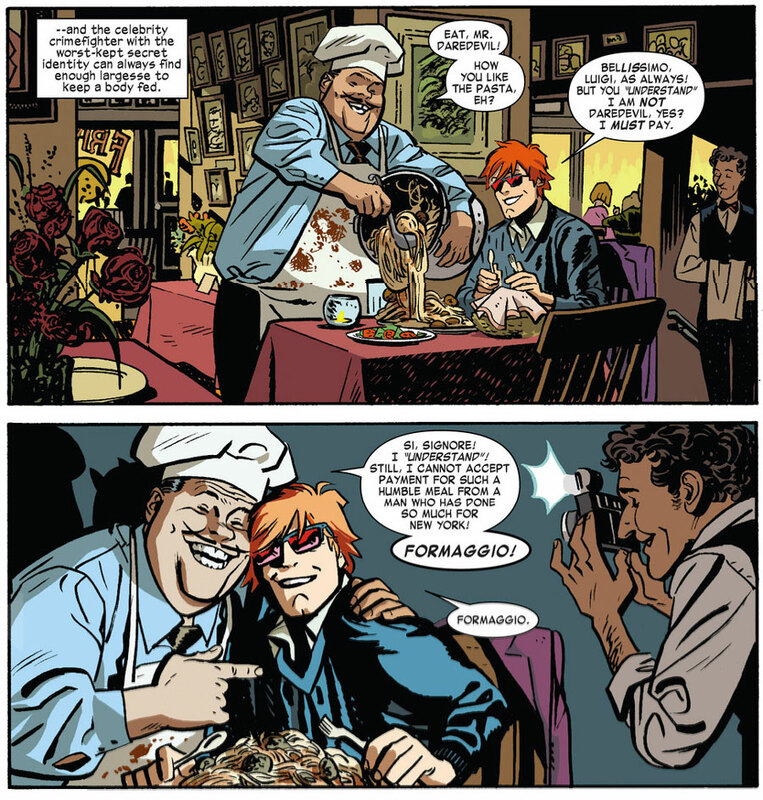 As seen above (in two panels that are so adorable I just want to tousle Matt’s shaggy hair), the creators take the opportunity to showcase the benefits of fame when Matt uses his “people more or less know I’m Daredevil” status to treat himself to a free meal. While this hardly constitutes a real world problem, it is very much a real world situation. (Well, except for the fact that he’s famous for being a superhero). The actual problems I alluded to above are to be found on the very first two pages, which in my opinion are almost as milestone-worthy as the last page. While Mark Waid has sort of been building up to this, I can’t remember ever seeing such a detailed and in-depth treatment of the everyday issues Matt faces as a blind person as the one featured in this issue. While he is certainly no ordinary blind person (though somewhat ironically, he technically sees less than the vast majority of “blind” people), there is a long list of tasks for which normal vision is required and the heightened senses combo really doesn’t cut it. The primary reason I think this has historically been downplayed is that most writers haven’t given it much thought. Another reason is the fact that we rarely get to see Matt in situations that highlight these issues. He’s either in the midst of battle, comfortable at home or busy playing lawyer. Most writers wouldn’t think to take us on a trip to Bloomingdale’s so Matt can buy a new sweater (unless they also intend for this excursion to be interrupted by a known super-villain). Mark Waid’s decision to actually probe this topic is to be commended. As is, by the way, Samnee’s fantastically paced and detailed artwork on that first page. Superb! The latter brings me to the next thing I wanted to mention: This issue is full of visual treats that will knock your socks off. If you’ve read this issue and still have your socks on, take another look. I love the details of having dollar signs reflected in Matt’s glasses when he talks about money and the reflection seen in the spilled liquids (both on the first page). Add to this one instance of Matt’s head casting a Daredevil shadow (see the panel above), the amazing splash-page showcasing Stilt-Man’s appearance, Matt’s visible disgust in response to smelly cheese and all the little details that brings this world to life. This has to be Chris Samnee’s best issue yet, and the same goes for colorist Javier Rodríguez’s. Having said that, I think it’s time to round off this review, which actually ended up a little less random than I thought it would be. Needless to say, I can’t wait for next issue. In case you didn’t know, Daredevil #23 will officially be part of the Marvel NOW initiative and promises to be a good jumping-on point for new readers, so go tell all your Daredevil-deprived friends that they need something red and horny in their lives. Yeah, I don’t care how that sounds. 😉 Take care everyone, and as always, please leave your comments (preferably spoiler-free) in the comment section! No sooner had I finished re-reading this issue for the fifth time, I noticed your review was up, and so I enjoyed reading that and the issue all over again! I loved, loved, loved this issue! As you point out, there is soooo much to relish! The humour in the panels, the dialogue, the way the action is set out and not forgetting Samnee’s artwork all add up to a top read. The thing I really liked though, was that it was so Matt Murdock heavy which always makes me happy! I think my favourite panel was the one depicting Matt as a magician during his conversation with Foggy. Is it just me, or does that suaveness, that assuredness (and the hair!) remind anyone else of a certain Mike Murdock? Also, and again I might be (am) reading too much into this but it seems to me there is so much more going on here with the possible appearance of both Typhoid Mary and a muddled up and boxed Karen Page. This taken in the context of their conversation speaks volumes about Matt’s past. Love your posts – often not long enough, and not meandering is vastly over-rated and never as interesting! Great issue! We’re getting used to Waid’s regular delivery of the goods but… He keeps doing it better and better! One thing I Likes was Waid’s update on Matt’s ability to “read”: he gives a realistic update of modern printing techniques, which are not so friendly to DD’s sense of touch nowadays. This was such a great issue. I really recommend reading Samnee’s Daredevil issues digitally (I buy both a digital copy and physical copies of each issue),because you get to experience each beautiful panel in isolation and are able to absorb all the wonderful little visual storytelling details without your eye automatically skipping ahead to the next panel. I would have to say that this was my probably my favourite issue yet. It’s funny because when Paulo Rivera announced he was leaving the title I thought no one could match the quality of his issues, but in the space of nine issues Chris Samnee has become my favourite artist of all time! I also recommend checking out his Thor the Mighty Avenger series, for more beautiful “cartooning” (as he appropriately called it in his interview with Christine). However, there was one panel in this issue that had me scratching my head trying to work out how to read the action. It’s page 4 (not including the cover or recap page) and panel 3. Did Matt get tossed into the alley by Spidey’s webbing? Or did he leap into the alley and deflect Spidey’s webbing with his cane? That minor confusion aside, there really is so much to love about this issue. As much as I just loved the body of the issue, and the superb art from Chris Samnee, it was the final scene that really made me love this issue. And not just because of the revelation. One of the real cores of this title is the relationship between Matt and Foggy. It’s endured an awful lot over the years, and it’s hard to think of a ‘civilian’ relationship that is as important to a title as this one. As much as I enjoyed how Waid pushed these two apart (especially the reversal in last issue), the thought of reading an extended run of the title without Franklin Nelson as a major supporting character was not one I was relishing. (In fact, considering what these two have gone through, I would have thought less of Waid forcing them to be apart.) Just having the two of them in the same room, talking and listening to each other, was superb. For a long time now, the rationale behind Matt’s motivations has been a great scene towards the end of the Bendis run where Foggy confronts Matt over his extended breakdown following the death of Karen (I’m paraphrasing it, the actual comics are a long way away from me at this moment). It was really great to have a piece of character development and an interpretation of Matt’s character that isn’t about the collapse of his mental health. I loved how Waid positioned Matt’s thinking and reactions. Whatever comes next for these two, the fact that they will (hopefully) be facing it together makes me look forward to the next issue even more. I agree. This is a great issue. However, I have two questions. One, why does Foggy eat like a pig? Two, How is Stilt-Man alive? Didn’t Punisher shoot him in the crotch with an RPG? Yeah, the eating was a little… gluttunous? He finished off the whole thing, too! Regarding Stilt-Man, I would assume that this is a new guy (as you say, he’s supposed to be dead). The old dead villains do seem to have a tendency to spawn crazy copycats. I’ll have you know I ran out to buy the comic just so I could read this review. Kudos to you, Christine, shotgun and all. Second: Foggy’s eating habits remind me … has he ever had a heart attack? I can’t remember. But somebody should’ve gone down that road by now. I am not a frequent commenter here (actually I’m not sure I’ve ever commented at all!) but I do read and enjoy your reviews every time a new issue comes out. I agree with everything you wrote about #22, and I have to say that this one is possibly my favorite of Waid’s run/maybe even of all time. It just hit the mark on so many different levels. My only disappointment is that I have to wait a month for the next one! Great issue and a great review to along with it. Seeing that Marvel has a policy of offing a significant character every 6 months or so, I’m slightly more worried than I should be with the direction this is going. Is this a “significant” Marvel character? I seem to think so. Also, by some fluke, in seeing Karen in that one panel I was reminded of her death and her illness being revealed to be an illusion made by a certain villain. Without question, I believe Waid is a better writer than that. I can’t wait to see where he take us with this. This was another great issue, from the informative beginning to the exciting fight to the bleak and scary ending. Samnee has really stepped up his game here, the scenes where DD focuses past the noise to defeat Stilt-Man really stands out. Waid does a great job in balancing the ‘wrongness’ of Spidey without actually crossing the line. DD’s jab at Ock being a ‘fat tub of lard’ was funny too. The new revealations, the new understandings of the friendship between Matt and Foggy continue to surprise and amaze. Matt appears serious about trying to break his old habits, but now he needs to search deep for the strength to help his best friend through what may be the most difficult battle of his life. Kudos to Waid for another terrific and gripping issue.